Laravel TestTools is an awesome and easy to use Chrome Extension. You can install this extension on chrome and then press record and start creating dusk tests as you click around in your application. In this tutorial you will see just how easy it is to use. First, you'll want to head on over to the Chrome store and download the extension. We can now, login and register with our application. Next, to create a Dusk test we will want to click on the Settings tab. 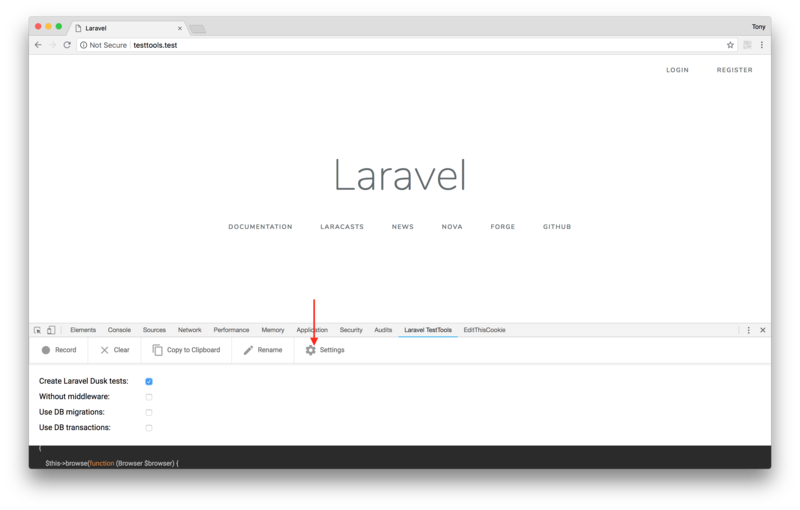 And then click the checkbox that says Create Laravel Dusk Tests. Before we move on, go ahead and create an account by registering a new user in your application. Now, we are ready to create a test. Click on the Record button in the Laravel TestTools tab. You can now add this to your Dusk test folder and it will be added to your test suite! Since it's super easy to create Dusk tests, there should be no reason you're not adding tests to all your applications.